The Panamanian teak plantation Global Property Advisor featured in January 2018 had only 25 parcels left in December. Now the inventory is down to 10. That is a seriously limited inventory. And each parcel makes a return from 10.4% up to 690%. An investment this attractive means these last 10 are going to sell out soon. The few remaining parcels are 1/4 of an acre and cost US$22,500 each; add Panamanian residency and the cost goes up US$4,680. Gross harvest proceeds are US$38,217 for a low-quality crop. The management fee (so you don’t have to roll your sleeves up and break a sweat) is 20% (US$7,643). The processing cost is charged at 15% (US$5,732). That leaves the proceeds to be US$24,842 net. This is a 10.4% profit after the management fee and processing cost. But, all these numbers are based on the crop being low-quality. In other words, this is the worst-case scenario and it will probably not happen. A few good years of high-quality growth, and your numbers change dramatically. Gross harvest proceeds hit US$273,471. The management fee and processing cost stay at 20% and 15% respectively. The management fee sets you back US$54,694 and the processing cost is US$41,020. Suddenly, your net stands at US$177,757. Take away your initial outlay of US$22,500, and you’re getting slapped in the face by a US$155,257 profit (690%). Note, this doesn’t take into account a flat marketing-board fee, which is US$7,831 and applicable regardless of growth being high or low. No, he isn’t. But teak is a commodity crop, and demand has been outstripping supply for years now. Unlike certain residential neighborhoods in the real estate game, for example, agriculture such as teak doesn’t go in and out of fashion. It’s a stable player in its market. Between 2005 and 2014, the global annual trade of teak roundwood was more than 1 million square meters on average. Teak imports reached US$487 million a year, and accounted for 3% of the global timber trade. India, which accounts for 74% of the world’s teak imports, is the largest demander of the wood. It sources teak from 100 countries. India makes up 80% of all teak trade across the world. Thailand is in second place, boasting 16% imports and sourcing the wood from 15 countries. China comes in third, accounting for 10% and importing from 65 countries. Another market factor to consider is that global trade for teak logs has more than doubled since 2000. And this teak investment is capitalizing on that. Your parcel of land will sell 18 cubic meters of logs when it harvests after 8 years. This helps maximize your profits. Get in touch with the plantation management here, and they’ll proudly tell you that these trees, in the Darién region of Panama, are going to be harvested in just about six years. When I spoke to them, they were excited about this because it is far sooner than nearby teak plantations in Nicaragua, for example (some plantations can take up to 25 years, as the trees are small saplings). And everything is turnkey in this investment—no need to grab a shovel. 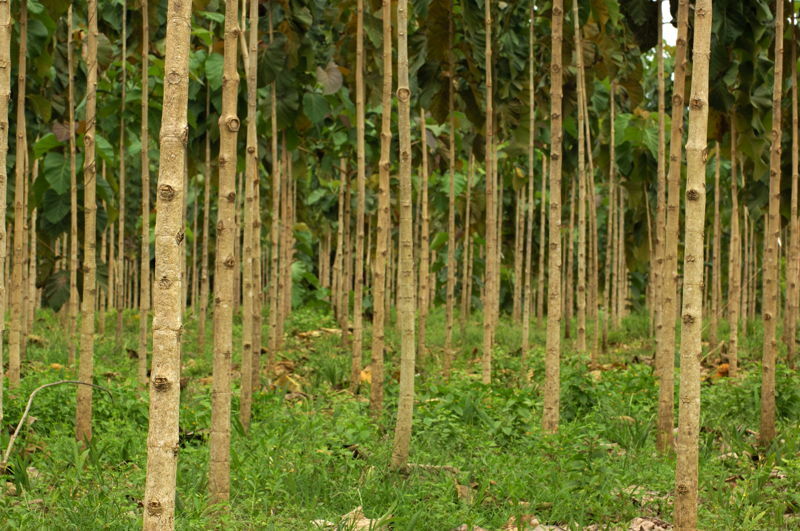 The timber company does the planting and growing. When that’s done, they harvest and organize sales on your behalf. And don’t forget the offshore diversification. For an extra US$4,680, this investment can lead you to Panamanian residency. Panama uses the balboa, which is pegged to the U.S. dollar, so the currency play is safe. Panama’s corporate law mirrors that of the States, giving you greater investment security. And your trees are taxed at harvest so there are no taxes for just under eight years. Why Do Agricultural Portfolio Plays Pay Off? No matter how big (or small) your real estate investment portfolio is, it should include agriculture. a legacy that can be handed down to future family generations. Unlike a residential lot in a new development or a plot of raw land that is still pending planning permission, agriculturally productive land always retains its potential to make money. In other words, the land will always be able to produce something of marketable value (fruit or wood to name but a couple). If it can be harvested, it can make you money. you can pass the land down to future generations, so they can earn an income from its harvest, use it as loan security, or sell it. Shares of a teak company are a soft asset. Agriculturally productive land, on the other hand, is a hard asset because you own something tangible. Hard assets give the investor more control than soft assets because the investor is the actual proprietor (often exclusively so). Only 10 parcels of this teak investment remain. And, let’s face it, there are many more than 10 people reading this right now. And who wouldn’t be up for a US$24,842 or US$155,257 net profit? These parcels are going to run out soon, mark my words. To learn more about this US$155,257-profit-making teak plantation in Panama, get in touch with the developer here.